BASS CAMP festival is clearly on a roll. Over the last couple of years, it's been responsible for bringing artists from across the world to India's bass hungry fanatics. No holds barred - from dubstep to drum and bass, garage and electronica. 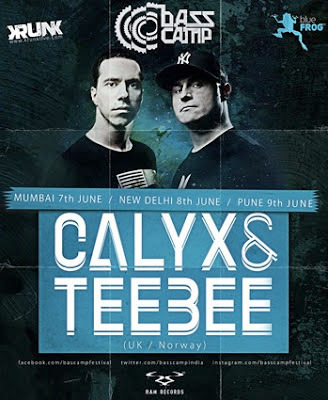 And, in keeping with their bi-monthly format, the boys at the camp have recently announced the headliners of their eagerly anticipated summer edition as the D&B duo of Calyx & Teebee. A UK/Norway based duo who have been producing D&B since the mid 90s and who've released on iconic labels such as Moving Shadow, Metalheadz, V Recordings, Renegade Hardware and Subtitles. In charge of their own imprint, Calyx & TeeBee also head Momentum Music, which marked its first release with their debut album. The 'Anatomy' LP proved to be one of the most highly anticipated albums in D&B for years, gaining massive support from the scene's big players and topping sales charts for months. Since then there's been no stopping them. Touring non-stop across the globe and venturing into joint DJ sets featuring 6 decks and 2 mixers with both DJs in action simultaneously, they also started work on their follow-up LP which would see them take five years to complete. With a current musical perspective that covers a range of styles and sounds, they once again threaten to change the game as we know it today with this release. You should be excited.